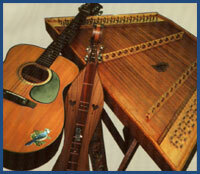 To install computer wallpaper featuring the hammered dulcimer and other folk instuments on a PC using windows, click on the image you want as your wallpaper. This will take you to another screen where you will see the image full-size. Right click on the full-size image and select Set As Wallpaper or Set As Background. Copyright ©2005-2019 Uncle Carl's Dulcimer Club. All Rights Reserved.